It appears that BioWare will be releasing day one downloadable content for Mass Effect 3. 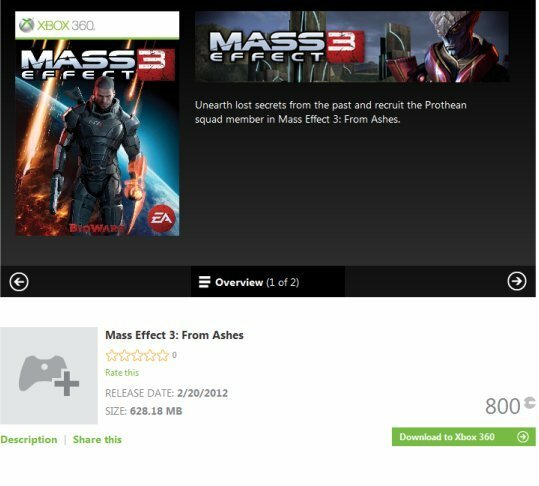 Xbox Live Marketplace outed the DLC pack, dubbed "From Ashes," which will add a new squadmate for Shepard. Warning: The squadmate's identity is a bit of a spoiler for ME3's plot. The DLC has since been pulled from Xbox Live but not before the juicy details were uncovered. It adds a new squadmate who is apparently a Prothean. The Protheans are the ancient alien race thought to be wiped out by the Reapers long before the events of the ME trilogy. However, it's revealed in ME2 that the Reapers turned many of them into twisted servants called "Collectors." "From Ashes" weighs in at over 600 MB. Like the DLC companions in Mass Effect 2 and Dragon Age, this probably means that a new mission or two is included in the pack. I'd hope so, because it's a fairly pricy add-on: 800 MS Points, or $10. "We're happy to confirm that Mass Effect 3: From Ashes DLC will be available at launch for all platforms," said BioWare's Mike Gamble on the official game forums. "For those of you who have purchased the N7 Collector's Edition (including the PC Digital Deluxe Edition), you will get this content at no extra charge. We'll have a lot more details for you later this week! Stay Tuned!" BioWare did a similar thing with Mass Effect 2, providing players with a mercenary squadmate called Zaeed on launch. The big difference, though, is that Zaeed was free for everyone who bought a new copy of the game. Everyone who buys a standard edition of ME3 will need to fork over money for this squadmate - that's not going to go over well.